On the one hand, the economy continues to grow steadily and moderately. 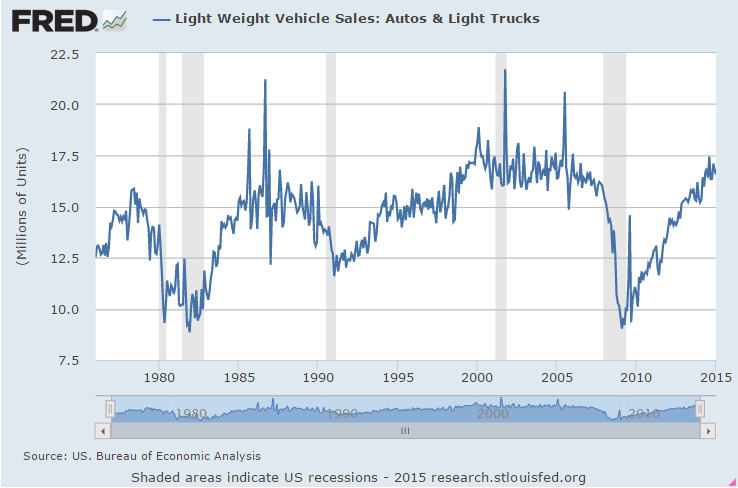 Sales of cars and light trucks are strong. 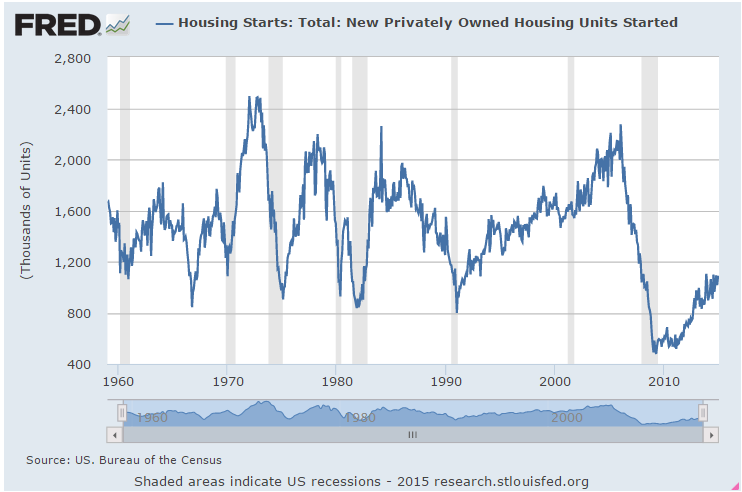 Housing Starts of new homes are slow. While homebuilders remain confident, there is a noticeable decrease in traffic from first time home buyers. 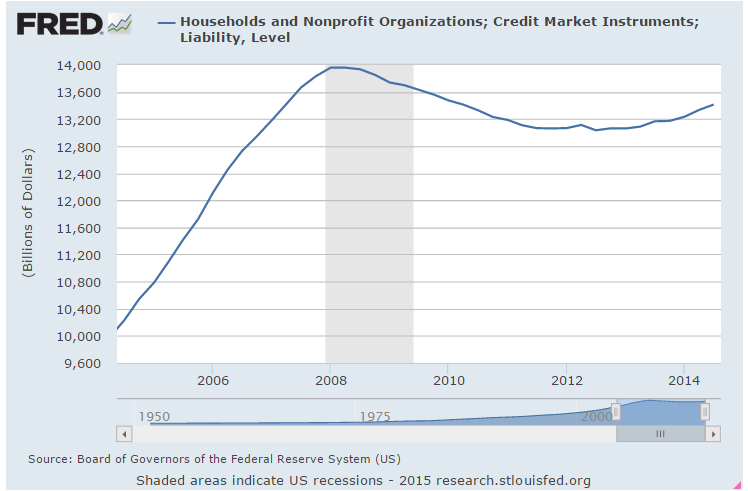 The debt levels of American households have not reached the nosebleed levels of 2007 before the onset of the financial crisis. However, they are more than a third higher than 2005 debt levels. 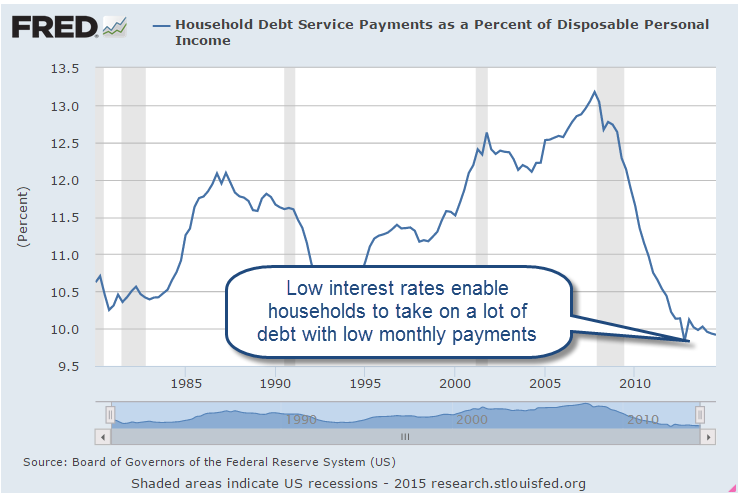 Historically low interest rates have enabled families to leverage their monthly payments into higher debt. As a percent of disposable income, monthly morgage, credit card and loan payments are the lowest they have ever been since the Federal Reserve started tracking this in 1980. As long as the labor market grows at a moderate pace and interest rates remain low, families are unlikely to default on these higher debt loads. 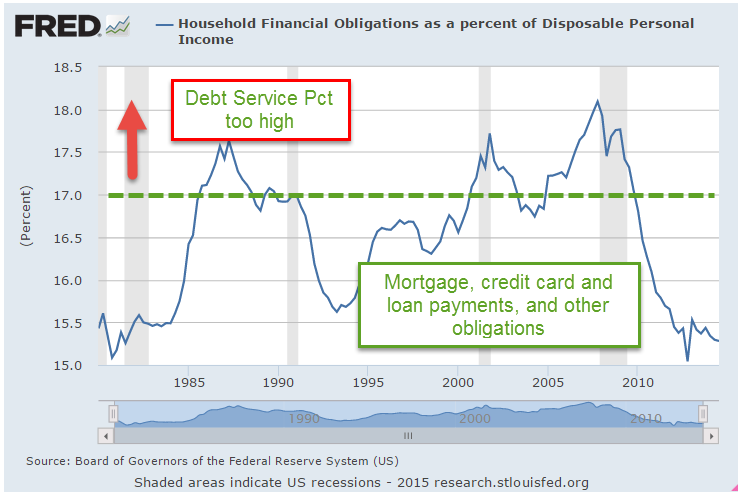 In addition to household debt, the Federal Reserve includes other obligations – auto leases, rent payments, property taxes and insurance – to arrive at a total Financial Obligations Ratio (FOR), currently about 15%. (Explanation here) The highest recorded FOR was 18% in 2007. The amount of income devoted to servicing the total of these obligations – 15.28% – is near historic lows. (Historical table ) In the past, when this rato has climbed above 17% there has been a recession, a stock market crash, or both. So there are three components of a family’s monthly obligations: mortgage payments – currently less than 5%; credit card and loans, currently 5.25%; and other obligations, also about 5.25%. Should interest rates rise in the next two years, credit card and loan payments will rise above the current 5.25% but are unlikely to cause a crisis in household finances. The percentage of home mortgages which are adjustable have been rising in the past few years but the growing number of these mortgages have been so-called jumbo loans to households with larger incomes. (Daily News and Wall St. Journal ). Rising rates will put increasing pressure on homeowners with these types of mortgages but are unlikely to generate a crisis similar to 2008. When someone says the dollar is strong, what does that mean? Investopedia has a fairly concise explanation of the foreign exchange market (Forex) and the history of attempts to structure this market, the largest in the world. Costs for Medicare and private insurance have grown at annual rates more than double inflation since 1969, as shown in a 2014 analysis of 35 years of Medicare (CMS) data by the Kaiser Family Foundation. The only good news is that Medicare annual growth has been 2% less than private plans. In its 2013 annual report (highlights) CMS noted that Medicare spending for the past five years had grown at a relatively tame 4% or less – almost double the inflation rate. This is what passes for good news in federal programs – spending that is only slightly out of control. Medicaid costs are growing at 6% per year. Congress and CMS know that they have got to improve spending controls but the players in the health care industry spend a lot of money in Washington so elected and non-elected officials tread carefully when proposing any reforms. Last month, Health and Human Services (HHS) announced that, by 2018, they would like to make half of Medicare payments to doctors based on the quality of care they provide, not the number of procedures they do. 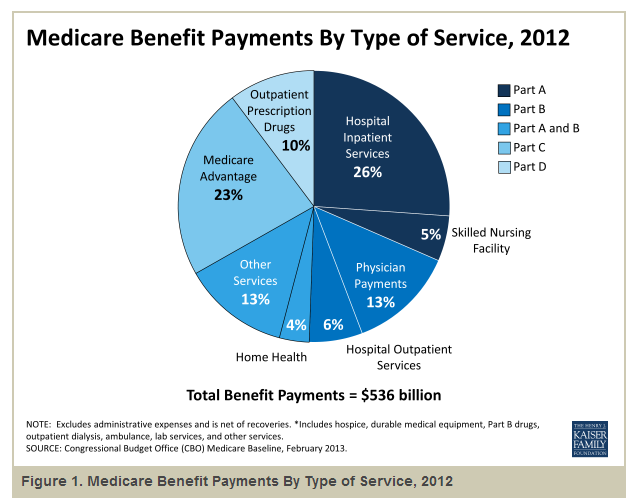 Under the ACA, 20% of Medicare payments are based on outcomes, not fee for service. Although HHS says it has saved $700 million over the past two years, few provider organizations meet the guidelines to share in the savings as originally designed. As the population ages, Medicare will consume an ever larger percentage of total health care spending. 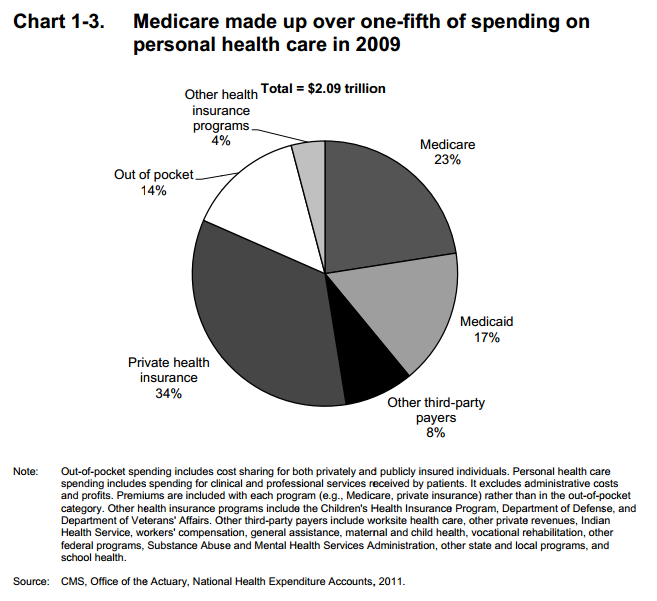 CMS noted that Medicare’s portion of health care spending in 2013 has been relatively steady over the past few years. A pie chart from 2009 spending illustrates the cost breakdown. In 2013, we spent 17.4% of GDP on health care, a figure that has remained stable for a few years. In 2001, the U.S. spent a shocking (at the time) 13.7% of GDP on health care (CMS Source).